I’m so excited to still be in the competition. If you haven’t done so yet, head over to So You Think You’re Crafty and Check out this fabulous season! Today I’m sharing a tutorial on making Pjs with footies or footless all at the same time! Scroll down to the bottom for the tutorial and more pictures. I loved this challenge! I really enjoy re-making clothing to something different and new. Kids can always use new pajamas, so I was excited to tackle making my own patterns and trying make some cute clothes. I used Carters PJ line as inspiration. I know its not knock-off week, but a girl needs some inspiration! My t-shirts turned into adorable pajamas. 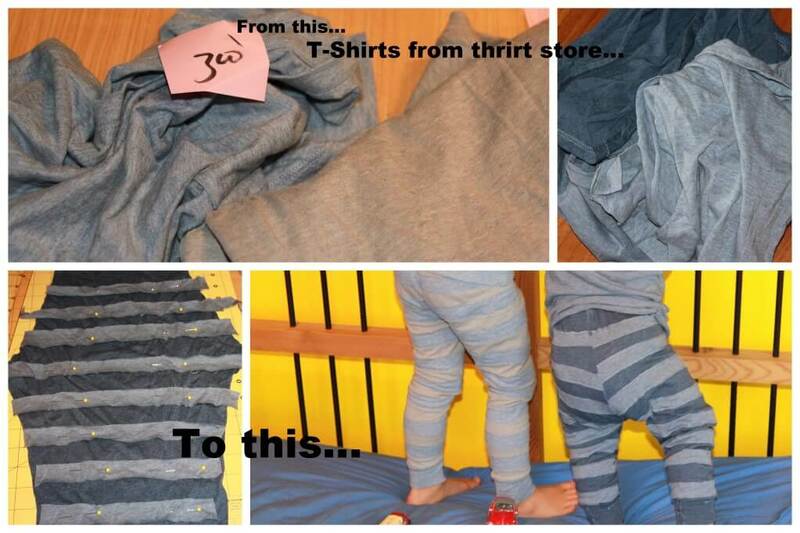 This project took three shirts, used in different combinations to create two different (yet similar) sets of pajamas. Getting the models to co-operate was a challenge! (Faces covered to keep anonymity) I put cute felt trucks on the front, which the boys love. One is a cement mixer and the other a dump truck. I think the feature I am most proud of is the fact that the pants can be footies OR footless. Whatever you want, or whatever the weather needs. They just fold up or down depending on how you want to wear them. nice! I first made my own patten by tracing another pair of Pajamas that fit will. I love to keep the original hem on the shirts as I find those hard to replicate! I saved some fabric to make the cuffs and also the original neck bands. I like to just sew these right back on. I pinned and hand sewed on my felt appliques. I also made the stripes myself. I used my rotary cutter to makes strips of fabric, then I used the board to lay them out evenly. I pinned then sewed them down with a zig zag. 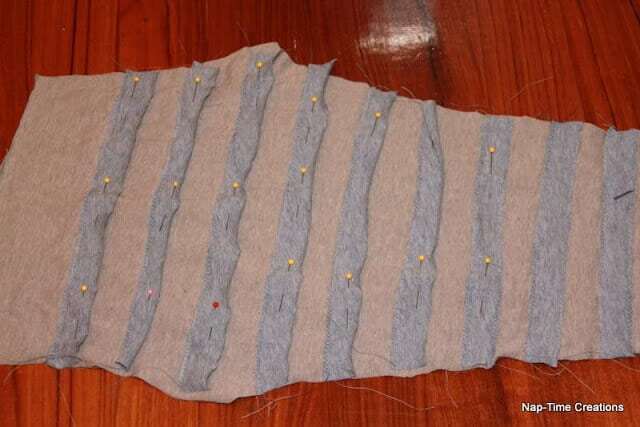 I found it was best to sew all one side of the stripe, then turn and sew all the other sides. Okay…on to the footies tutorial. Make a 6 inch cuff. I used t-shirt material, but I think ribbing would work a bit better. You want it to be a pretty tight cuff. Sew cuff to leg now or at the end is fine too. 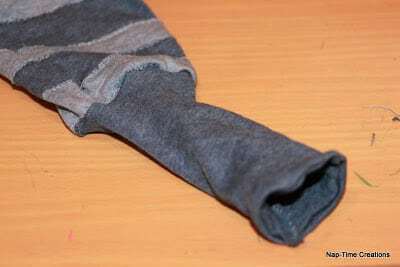 Make a little “pocket” out of your fabric. Shout be the same width as the cuff and around two-three inches long. 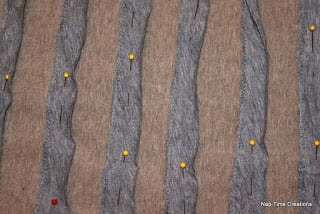 If you have a serger, finish the raw edge. Lay the pocket 1 inch from the bottom edge (on the front of the pants) and sew the pocket to the cuff leaving the pocket open. Only sew the side the is touching the cuff. Don’t sew the cuff shut! And here is the back side. You now have a removable footie! 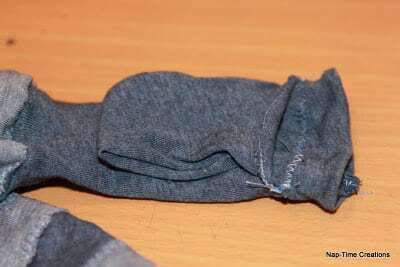 To fold up the cuff (and remove the foot). 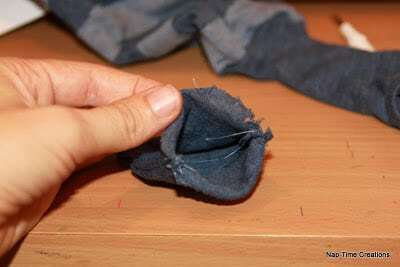 Fold the pocket part up. 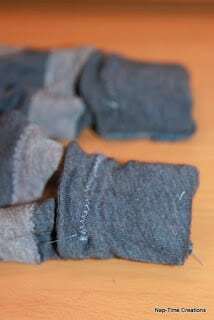 Then fold the whole cuff up once. The pocket should be tucked inside and hidden away. It works really well and should be perfect for the colder months. 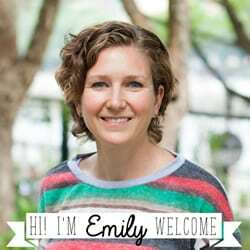 Great job this week Emily! I thought this one was yours!! Good luck on the rest of the weeks! I love those pyjamas …I know that boys are harder to make things for but you have done a great job!